With the backlog of cases from 2015 cleared, Bart Logue prepares to launch the first ombudsman investigation. Spokane City Hall has emptied out and gone dark for the night, but one first-floor office glows soft yellow. Police Ombudsman Bart Logue is working late again, awash in the light from his computer screen. For the former Marine Corps diplomat, the long hours are taking a toll. As the sole person charged with overseeing the police department's internal investigations, Logue regularly works well into the evenings and spends many weekends attending community events. Logue's concerns over the office's workload boiled over in a contentious public meeting earlier this month. During the meeting, Logue explained to the ombudsman commission — the five-member volunteer board that acts as his boss — that he and ombudsman analyst Luvimae Omana consistently work beyond the required 40 hours a week without compensation. "This office is not staffed appropriately," Logue tells the commissioners. "And I'll say it again, this office is not staffed appropriately. These are expectations that are unrealistic, and to continue to put that on two people, I have a problem with that." 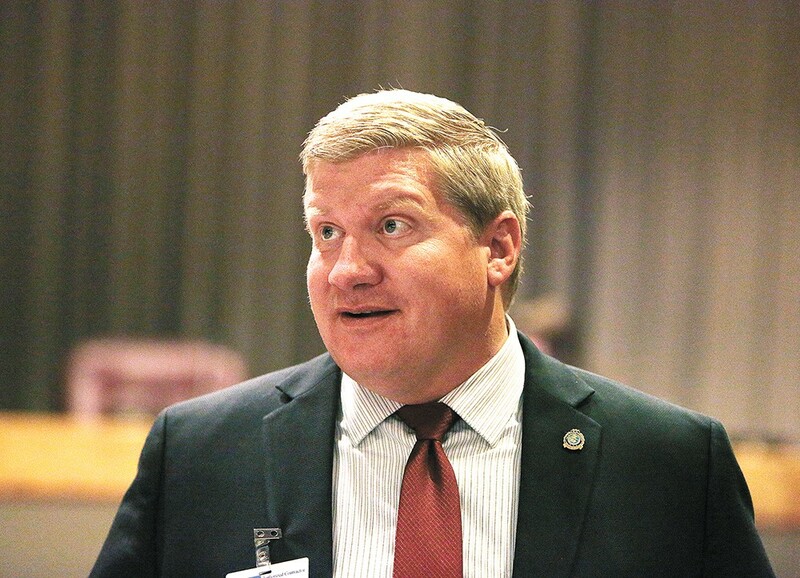 Logue's comments prompted commissioners to vote to close the office to the public on Fridays if its employees have worked the required 40 hours. Commissioners also praised him for doing an "outstanding job," and expressed frustration with the perception that city administrators only pay lip service to the police oversight office. "It's a start," Logue says. "But what I really want is a person." And now, potentially, come new duties: City Councilman Breean Beggs plans to introduce a new ordinance that, among other changes, requires the ombudsman to write detailed "closing reports" that include "independently determined material facts." Logue sees value in a police watchdog empowered to write his or her opinion on the outcome of an investigation. But he raises concerns about placing more mandates on an already overburdened office. He questions how to reach a "material fact" if the ombudsman can't compel an officer to participate in the investigation. "That's a pretty strict legal standard," he says. "I need to have the tools to arrive at those. That's all I'm asking." Much of the ombudsman's impact on investigations into alleged police misconduct under the current ordinance comes from the ability to sit in on internal investigations and ask questions, Logue says. But the only voice the ombudsman has is the ability to "certify" a case as timely, thorough and objective. If an investigation does not meet all of those criteria, Logue sends the case back for more digging. So far, the department has obliged. In Beggs' draft ordinance, a new emphasis on "closing reports" amplifies that voice. "[The reports are] just to show what happened, and identify ways that would prevent harm in the future," Beggs says. "That's what people want out of that office, an independent, objective person to say 'This is what happened.'" Spokane Police Guild President Sgt. John Griffin has not seen the proposed changes and declined to comment. The draft ordinance also more clearly defines the path for the ombudsman to launch an investigation outside of the police department, and specifies that it cannot impact officer discipline. Rather, they are intended to offer an objective summary of facts and provide a basis for recommendations to the department. Officers are not required to participate. Exactly what an ombudsman investigation looks like, though, is left purposefully vague in Beggs' proposed ordinance, so that the ombudsman can tailor it to each situation. This year, Logue will attempt the first-ever ombudsman investigation. He intends to dig deeper into a use-of-deadly-force incident outside the House of Charity, he says. The officers in that case were cleared of criminal charges and internal policy violations. But during internal interviews, one officer, who fired a rifle, told investigators that he aimed for the man's head. That answer, and the lack of a follow-up question by SPD internal investigators, is Logue's jumping-off point. His investigation will seek to determine how and where officers are trained to shoot in Spokane. "My doing this investigation isn't to say that I think the police department's all jacked up," Logue says. "But what were the other options available to that officer at the time? If there weren't any, that's something that we really need to talk about." In an email to Logue, Chief Craig Meidl ensured SPD's "complete cooperation."